GENIUS LOCI STARTED IN 2012 AS A SURFING ADVENTURE SOUTH OF THE BORDER WHICH HAS EVOLVED INTO A BEAUTIFUL AND INTIMATE BEACHSIDE FESTIVAL. NOW INTO ITS 7TH YEAR, THE TEAM BEHIND GENIUS LOCI IS LOOKING TO CONTINUE CREATING MAGIC BY BUILDING A BRIDGE BETWEEN THE SURFING, MUSIC AND YOGA COMMUNITIES OF BAJA NORTE AND SOCAL. The definition of genius loci is the prevailing atmosphere, spirit or character of a place. Genius Loci is Nestled at a private beach on the sandy plateaus alongside the Pacific Ocean in northern baja. The location is pure magic, please help us keep it this way and make it better. Join us this summer if you would like to wake up with the waves, surf with the dolphins, dance in the sand and party under the stars with your friends. 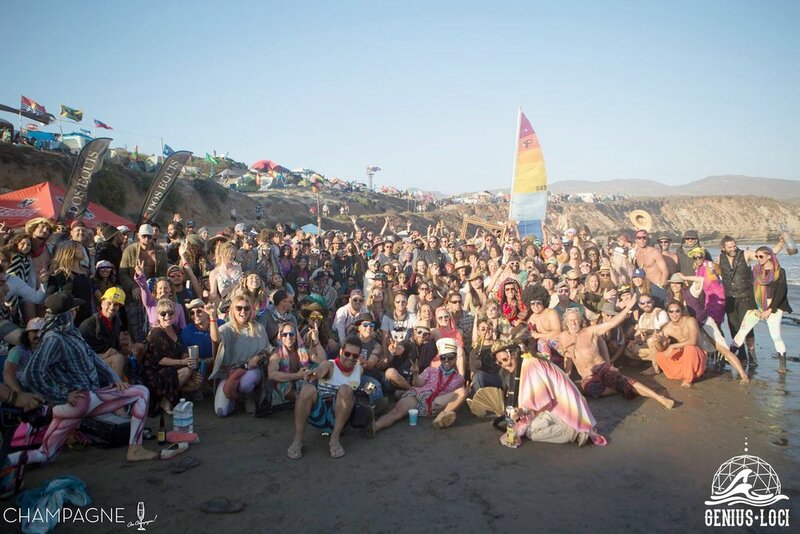 Genius Loci was Started by a tight-knit crew of artists and musicians from venice beach and ensenada and it is a perfect experience for those who appreciate the simple pleasures of festival life. BE GREEN. SAVE MONEY. MAKE FRIENDS. Want to Ride Share? We support you in any efforts to reduce our carbon footprint and Leave No Trace. Sign up to Host or Join a Carpool to Genius Loci Fest HERE. TARGET LOCATION: PUNTA CABRAS BEACH, BAJA NORTE. PLEASE NOTE: Do not drive at night in Mexico. Drive slower and more defensively than you would in California. The main highway in Mexico is a toll road. It costs about $6 to go from Tijuana to Ensenada. They take pesos and American dollars at the Toll Booths. Have CASH! 1. Take I - 5 south to the San Diego Tijuana border crossing. CROSS AND STAY IN THE FAR RIGHT LANE!! 2. After crossing you will immediately exit right towards "Playas Tijuana/ Rosarito Cuota". This is an Exit on the Right JUST AFTER the Border Crossing. DON'T MISS IT!!! 3. Continue straight on the "Tijuana - Ensenada" Road. 4. Take the ramp labeled "Ensenada Cuota/ Mexico 1". 5. Merge onto "Tijuana-Ensenada" Road. 6. Continue onto "Mexico 1D" for 56 miles until you reach Ensenada - please note there might be a detour at La Fonda that takes you up and into the hills around the highway, they are working on the highway there. It takes about 30 minutes to get back to the main highway. 7. Once in Enseada continue on "Rosarito - Ensenada/ Carr Federal 1". This is the main Boulevard in town and it runs along the coastline. When in doubt, head south. 8. Turn Left onto "Boulevard Estancia"
9. Turn right onto "Ensenada - Lazaro Cardenas/Carr Federal 1". Take this road for 42 miles. You will pass through a town called Maneadero. There is a supermarket on the Left side of the street called "Maria Luisa". This is the last spot to get all the Tequila, Taco Ingredients, Pasta, and Wine for the theme nights. Continue driving south to "Santo Tomas", (this is where the last gas station is). Continue on the main road for 16 miles after Santo Tomas and then you will take a right on the small dirt road to Erendira. ->(This road on the right is slanted at a 45 degree angle at about 2:00). If you reach a town called San Vicente, you missed the turn for Erendira, turn around and head back. 11. It's 10.5 miles between the main highway and Erendira. It is a fun drive, mostly along a dry river bed. Don't go too fast and slow down as you get to town because the police station is right at the beginning of town. On google maps the road is called "13 De Diciembre". 13. Take the main road 1.5 miles slowly through town until it ends at the ocean. Take a right on a wide but bumpy dirt road along the ocean. 14. Follow the dirt road slowly for 6 miles along the ocean until you reach Punta Cabras. Please Drive Slow- to protect your vehicle, and to reduce kicking up dust. 15. After you go uphill past what seems like a ex-pat community, bear left at the Genius Loci Signage. We want you to be prepared and comfortable at Genius Loci. Please check out our list of what to bring, and what NOT to bring. YOUR NON-EXPIRED PASSPORT!! OR Your Driver's Lic & Birth Certificate. CASH CASH CASH for food at the GL Kitchen, Bar, etc. No CC there. Light Boots or Slip on Shoes that protect feet from small shell pieces in sand, & Flip Flops. Headlamps!! HEAD LAMPS, FLASHLIGHTS, LIGHTED THINGS OF ALL KINDS. Shower Tents + Shower-bags. There are also showers for purchase this year. A shade structure - Steak it down well! The wind can kick up! Lots of trash bags = this is a leave no trace camp out, pack it in pack it out!!! Firewood and Duraflame logs. Contained & Safe Fires ARE ALLOWED. BUT BE SAFE! Shoes that you would wear at Burning Man. At least one pair of closed shoes for deep sand with sharp pulverized shell pieces. Don't CUT YOUR FEET!! Unwanted/ unused clothes in good shape to donate to the local charities!! Genius Loci is a semi remote wilderness camping experience on the beach in Baja Mexico. The name of the location is Punta Cabras. It is just north of the town of Erendira. It is about 2.5 hours south of the US/Mexican border. Do not drive at night in Mexico. If you are stopped by authorities or police, do not say you are going to Genius Loci. Indigenous people have been coming to the Punta Cabras region for over 10,000 years to fish and collect shellfish. We are beyond lucky to be using this land and it is mandatory that everyone respects the land and local people. This is a leave no trace campout. This is a campout/ mini festival. It is not a rave. It's a collection of beautiful people that want to have an amazing experience/adventure in Baja. We will be camping. There is basically no infrastructure there. We are bringing in generators and porta potties. We will have 24/7 security via the local Police. This is a camping event. We love you, but please don't complain about camping at a camping event! 1. You are responsible for yourself. We love you, but please do not do anything stupid. If you think you are about to do something stupid, please stop. If you see someone else about to do something stupid, please stop them. Love your brother, love your sister, don't let them act stupid. Stupid in Mexico ends poorly. Don’t act stupid. Be polite, conscious, awake, and have fun. Don’t act stupid. 2. Do not drive at night in Mexico. You! Seriously! You have a purpose to fulfill in this world! You are a piece of the peace! Driving at night in Mexico is exponentially more dangerous...don’t drive at night. 3. Drugs are illegal in Mexico. Your car will get searched on the way down. They probably will not search your person, but your car will certainly get searched. Marijuana, weed, pot, grass, reefer brah, whatever you call it, is illegal in Mexico! You will go to jail for possession! Drugs are looked at a lot differently in Mexico than in California. Drugs in Mexico is not awake, is simply being unconscious! Let's choose consciously! Easy! Do not bring drugs to Mexico. Do not buy drugs in Mexico. Drugs are bad kids, Umkay? Hugs not drugs. 4. There will not be a lifeguard at Genius Loci. Do not go in the ocean by yourself or at night. If you cannot swim, do not go in the ocean. If you do not swim well, do not go into the ocean. Doing so would be stupid, we already asked you really nicely to not act stupid :) Easy! 5. Guns are illegal in Mexico. If you were thinking about bringing a gun, a weapon, or anything slightly related to a weapon, you are certainly at the wrong campout. We are one non-violent, peaceful family. Do not bring instruments to harm others. Weapons in Mexico in is simply being unconscious! Hopefully, you are beginning to see a pattern here! Let's be conscious, awake, and have fun. 6. There are cliffs around the campsite. We will do our best to mark the cliffs, but please watch where you are going and always have a flashlight on you at all times. Headlamps are ideal and hands-free. 7. You can cross the border with a passport, or a driver's license and birth certificate. 8. Cell phones do not work at the location....did we mention that you are responsible for yourself? Do not act stupid. 9. The last gas station before Punta Cabras is located in the town of Santo Tomas about 30 miles before Punta Cabras on the main highway. 10. Bring CASH, we cannot take credit cards at the location. The last ATM is located in the Supermarket in Maneadero, but we recommend getting cash in San Diego or Ensenada. Also, please don't act stupid. Please bring enough drinking water and food for yourself for the weekend. There will periodically be local vendors on site selling food. All this being said, it would be wise to bring enough food and water for yourself for three days. You are responsible for yourself. Q: What does the ticket include? A: Yoga classes, music, surfing, land permits, security, domes, sound system, organizational fees etc. Q: Do cell phones work there? A: We will be selling delicious cold beer and liquor. Q: Can we bring our RV? Q: Will my car make it there? A: We don't know your car, but any car that can drive to San Francisco from LA can make it to Genius Loci. WANT TO LEND A HELPING HAND? BETTER THAN GOODWILL!! Additionally, one county asked that we give them help with their Ambulance. If you can facilitate, please contact us or better yet show up with some stuff to style them out!